She'll ruffle some feathers on the beach in the Vilebrequin Kids™ Cockatoo Print Swimsuit. Square neck, one-piece swimsuit. Halter straps crisscross at back. Cockatoo print throughout. Full rear coverage. Lined. Shell: 80% polyamide, 20% elastane. Lining: 86% polyamide, 14% elastane. Machine wash cold, dry flat. Imported. This item may ship with an attached security tag. Merchandise returned without the original security tag attached or a damaged tag may not qualify for a refund. Measurements: One Piece Length: 24 in Product measurements were taken using size 12 Years. Please note that measurements may vary by size. 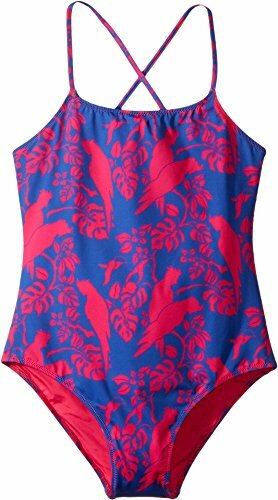 She'll ruffle some feathers on the beach in the Vilebrequin Kids™ Cockatoo Print Swimsuit. Halter straps crisscross at back. Full rear coverage. Lined. Shell: 80% polyamide, 20% elastane. Lining: 86% polyamide, 14% elastane. Machine wash cold, dry flat. Imported. This item may ship with an attached security tag. Merchandise returned without the original security tag attached or a damaged tag may not qualify for a refund. Measurements: One Piece Length: 24 in Product measurements were taken using size 12 Years. Please note that measurements may vary by size. If you have any questions about this product by Vilebrequin Kids, contact us by completing and submitting the form below. If you are looking for a specif part number, please include it with your message.